This is it, folks. This is the blog entry that everyone has been waiting for. As part three of my "Classic Beer Weekend" series I will be having a beer that may be the beer in the world that needs the least discussion: Heineken. That's right, Heineken. The green-bottled, Dutch beer that needs a review by me about as badly as the Eiffel Tower needs another picture taken of it and posted on Flickr. Oh, I've done that too in case you're interested. Heineken is one of those beers that I never want to drink. Every so often I'll order it in a restaurant when my only other options are Budweiser and Coors Light. Generally I find the taste overall very displeasing and usually skunky. Some say the skunkiness is light damage from the green bottle. Others say it's intentional. All I know is this is one of the beers I would be least likely to drink on regular ocassion. But a funny thing happened this week. In the wake of the flood I found myself drinking an awful lot of this. I had been buying this beer by the case for our super, who is maybe the best human being I've ever met. With plenty of problems of his own he was quick to help us with whatever we needed. Cases of Heineken were a welcome payment to him and I enjoy sharing a drink with just about anyone, even if I don't particularly like it. Michael Jackson didn't spend very much time talking about Heineken when he went to Holland. Heineken is the world's most widely distributed beer but instead he focused much more on some of the Trappist beers of that region, beer I would probably enjoy much more than Heineken. That being said, this Heineken (meaning the Heineken of the past week) has tasted somewhat different to me. Firstly it didn't have any skunky taste at all. Part of that, I'm guessing, is that I bought a full case. Being sealed in cardboard meant no exposure to light. 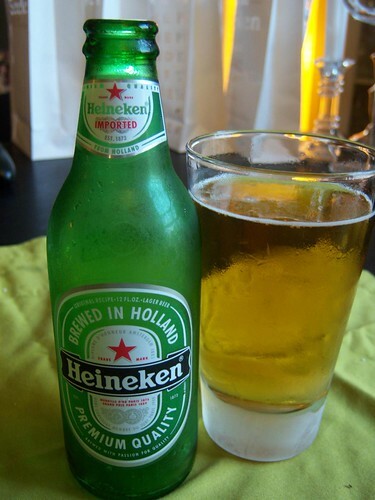 This beer was actually far more refreshing, crisp, and flavorful that the Heineken I remember. Generally I have Heineken at some sketchy bar where it's been exposed to light, temperature fluctuations, and no small amount of mysterious sludge. Seriously. One time I ordered it and it arrived with a slimy mud all over the bottle. The waiter was annoyed when I sent it back. When handled properly, poured into a glass, and enjoyed with others I was surprised at how tolerable this classic was. Last night, after dinner and my Pilsner Urquell, I settled down and drank this beer. I reflected on the events of the past seven days. It was not the week I had expected. Sometimes that is a good thing. The summer is effectively over. Soon I will be trying my hand at brewing my own beer when it cools down a bit. That way I can spend a lot of time and money to brew a beer that is probably worse tasting than any of the many lagers I've scoffed at in the past. So what's next for tomorrow night? Budweiser? Coors Light? I don't know, actually. I'm going to see what classic strikes me. To put a cap on this Labor Day weekend I need to do this right. And I need to hope that liquor stores are open. Connecticut will not be getting my tax dollars, that's for sure.